Nurses play a pivotal role in palliative care, from managing pain and attending to suffering, to communicating with patients and families, to coordinating care and leading other members of the palliative care team. Core Concepts in Palliative Care—Nurses is a comprehensive, self-paced course that provides a deep understanding of palliative care and delivers the specific skills and strategies critical for nurses in any healthcare setting. 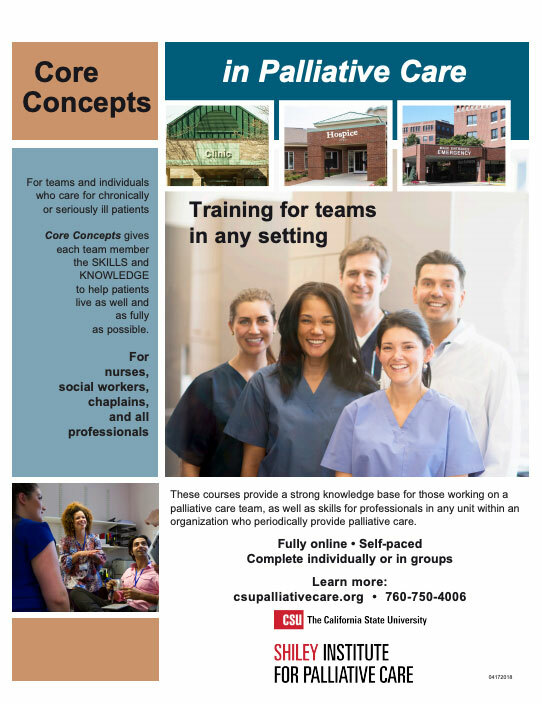 Core Concepts in Palliative Care—Nurses offers 17 Continuing Education Hours that will enhance your practice and your effectiveness in caring for seriously ill patients and families. This course lays out trajectories for the most common types of life-limiting disease, and explores effective interventions and pain management tools, as well as the role of nurses as leaders and advocates. Presented in an engaging and interactive online format, this specialized nursing education includes Core Concepts in Palliative Care—All Health Professionals, a foundational course in the Core Concepts series. Studies show palliative care training can improve patient outcomes, reduce hospital readmissions, lead to more effective decision-making, and boost employee satisfaction and retention.